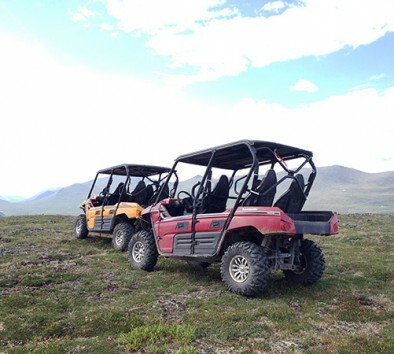 Climb in the driver’s seat or just come along for the ride in a sporty multi-passenger “side by side” ATV for an exciting afternoon of four wheeled adventure and hiking in boreal forest. Stop along the way to watch wildlife and the signs they leave behind. Your naturalist guide will take you on a trail to the bottom of the Klutina River Canyon, traveling over a moraine – the remnants of the glacier that once covered the entire river basin. Travel to the “Devil’s Elbow” named in 1898 by the men who travelled the area in search of gold. On this 20 mile trip, you will see the remains of a colossal landslide and spectacular views of Wrangell St. Elias National Park. Spring trips will bring an abundance of wildflowers and fall trips the colors of autumn. Wear comfortable walking shoes. Bring a rain jacket, camera and binoculars. The hike portion of the trip is approximately 30 minutes of walking over uneven terrain and unsuitable for those unable to walk unassisted.